LaShawnda has attended Heavenview for three years and decided on Sunday, October 26th to "let bad things go and start over fresh to get close to God." 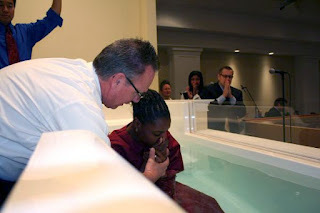 We celebrate with LaShawnda her decision to be baptized in the Name of Jesus. Her life will never be the same. Elmer made the decision to be baptized on Sunday, October 26th at Heavenview. We celebrate with him, the new life, He now has in Christ. Saturday Outreach continues to bear much fruit as one more is baptized into the saving name of Jesus Christ. Esther joined us at the mall and stayed afterwards for when our musicians got together to do their practice, Lili took the opportunity to teach her a Bible study. Esther desired to be baptized immediately. It was a glorious scene as our Youth spent some time in repentance before she went into the waters. We rejoice with Esther on this great decision. Well done Youth... Keep the fires of revival burning! 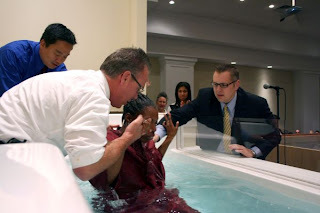 During Sunday's Celebration Service we baptized two... Last night at the evening service, the Holy Spirit moved in a mighty way as the people heard three different preachers minister the Word of God. The altar service was full with lives being reminded of their Spiritual Inheritance. Caleb, who has been coming for the services and had received the gift of the Holy Spirit with the evidence of speaking in tongues, decided to give his life to Christ and desired to be baptized. Amber is Jessica's friend. 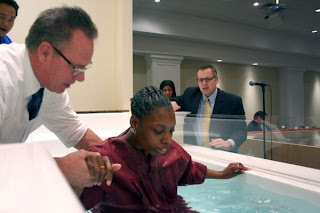 She chose to take the next step in her faith walk with Christ and was baptized on Sunday, October 19, 2008. Her life will never be the same! Daniel is Frankie's friend. He received the infilling of the Holy Spirit, was baptized in obedience to the inspired Word of God and began a new life in Christ on Sunday, October 12, 2008. Greetings in the Matchless, Powerful Name Of Our King and LORD, Jesus Christ! LOCAL GYM hears the GOSPEL of Jesus Christ. Another member of my local gym is baptized into the name of Jesus Christ.... My time at the gym has borne much fruit. Mc Claude, a chef, does his work out several times a week. We've had many conversations about the Bible and God. On Thursday this week we talked about being obedient to the Word of God. The Holy Spirit was present and I told him that there was an urgency for him that we get together. He agreed and we sat down in a cafe and we had a Bible study. He received revelation immediately. 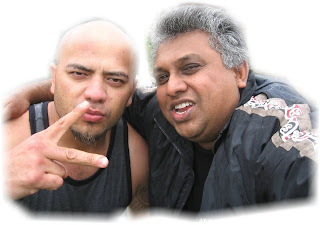 Mc Claude gave his life to Jesus, repented and was baptized into the name of Jesus Christ for the remission of sins. 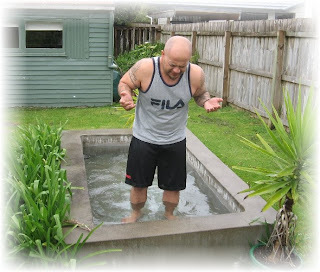 He was filled with the Holy Spirit when he came out of the water and spoke in tongues! Praise God. Mc Claude testified that he 'knew what had happened to him was right'. Glory! Several members of this gym have come to Christ and have been baptized and filled with the Holy Spirit. Churches here in Auckland are in our 26th day of the 40 day fasting and prayer for the Empowered Conference with Rev. Lee Stoneking (21 -23 Nov). The spirit of unity is bringing upon us a harvest. Chains are being broken over our cities and people are becoming even more receptive to the "voice of truth." Jesus said in Mat 17:21 ...this kind goeth not out but by prayer and fasting. 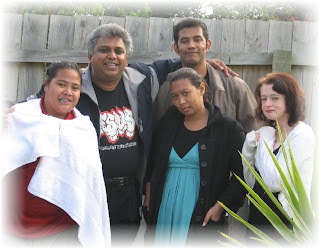 We need your continued prayer support for the work in Auckland, New Zealand. We thank you for all you do for His great cause. Liberia - Many thanks to God for sparing the life of Simeon Nyuah, son of Pastor Abraham W. Nyuah, who was bitten by a poisonous snake. It happened on the closing night of a 14-day revival at the church pastored by Pastor Nyuah. The church began praying and shared the request with the WNOP. We know that God touched Simeon and he is still alive. Last month we requested prayer for God's intervention in the security situation in Liberia. Armed robbery had been at an alarming rate in the capital city (Monrovia). Many people, including one of our pastors were victimized. We praise the Lord that the situation is now better. Botswana - The Ladies Conference resulted in an "Awesome Move" of God. We definitely went to another level. We had representatives from each church in Botswana. We thank God! 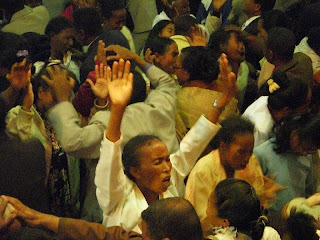 Madagascar - During our recent national conference, 1,435 received the Holy Ghost. Thanks for your prayers. Dem. Rep. of Congo - During the six Provincial Conferences, a total of 265 were filled with the Holy Ghost. South Africa - Twenty received the Holy Ghost, seven were baptized at a recent crusade in Cape Town. There were also 74 first time visitors. Lesotho - Pray that we can locate property, building or location for our Ministers Training Center. We also ask that you pray for protection and anointing for the Revival Teams that will be visiting the village Churches. Republic of Congo (Brazzaville) - We praise the Lord that Regional Missionary Gistophe and family are now on location in Brazzaville. Let's continue to pray for them as they get settled and make the necessary adjustments to this new country. We know we will hear great praise reports in the months ahead. Reunion - Please pray for the Institut Biblique de la Reunion with 5 staff members and 13 students enrolled thus far for the 2008-2009 school year.Seychelles - A request is being submitted to the government for permission to buy a plot of land consisting of approximately 1800 sq meters.. Pray for a favorable answer from the government. With our giving and our going we serve our generation by investing in missionary families and missionary endeavors around the world. We welcome your tax deductible contribution to help us with these efforts.